HEC Montréal Director Michel Patry, Executive Director of ENAP Guy Laforest, Director of the Office of the Graduate Diplomas Program Renaud Lachance, Director of Master’s Programs at ENAP, Michele Charbonneau, HEC Montréal Secretary General Federico Pasin, and Director of Education and Research at ENAP, Juliette Champagne. 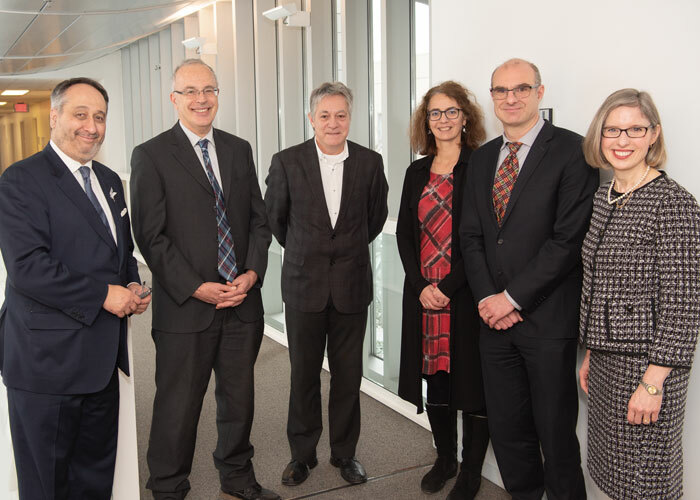 HEC Montréal has signed an agreement with the École nationale d’administration publique (ENAP) to create a new joint 15-credit Master's-level program. Admission to the joint Master’s-level program in management and public administration (PCGEAP) will begin in fall 2019. This training is sure to be especially useful for professionals working at the intersection of the public and private sectors. “HEC Montréal is proud to be joining ENAP to offer training that can concretely meet the needs of professionals interested in acquiring combined skills in management and public administration, and in keeping with our two establishments’ well-known tradition of excellence,” said HEC Montréal Director Michel Patry. ENAP Director Guy Laforest also expressed his satisfaction with this collaboration with HEC Montréal in creating the program and pooling the two schools’ expertise. “This new and unique short program will let students develop an overall view of management, better understand the realities in the private and public worlds and thus be more effective and versatile day to day,” he noted. Candidates for this program will have the option of enrolling at HEC Montréal or ENAP. They will need to meet the Specialized Graduate Diploma (DESS) admission criteria at the establishment of their choice.